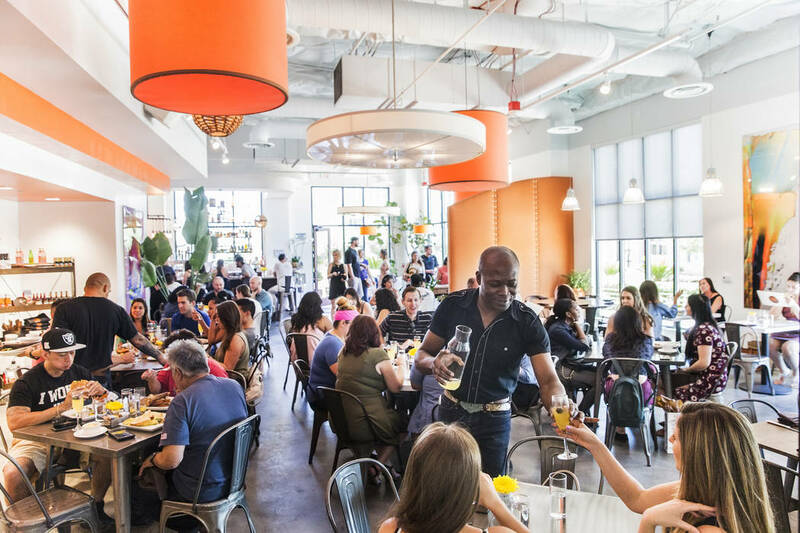 Las Vegas is home to many excellent restaurants for all hours of the day, but when you’re looking for a brunch spot you need something a little different. Here we’ve picked out three truly excellent brunch spots you need to try; each with their own unique menu and flavor to make your brunch memorable. Located at the Gramercy on West Russell Rd. in suite #190, the DW Bistro is one of the city’s most popular “off-the-strip” restaurants. If you’ve had a night out on the Strip and want to tone it back a bit for brunch, this is a great place to visit. The most popular time of day for the bistro is on Saturday and Sunday when their weekend brunch events occur. The restaurant is normally quite packed, as their food is top notch and the service absolutely excellent. The chef, and owner of DW Bistro, Dalton Wilson, hails from Jamaica. His ancestry is well reflected in his excellent brunch menu. With Jamaican spices and cooking techniques, the food takes on a one of a kind flavor and makes the menu all the more unique. The brunch menu features everything from pancakes to pastry baskets to french toast and chicken and waffles. Brunch is such a popular occurrence at the restaurant that the menu has grown to a full-sized one, featuring everything you could possibly want out of brunch, whether you want the sweetness of pancakes and pastries or a potent mix of spicy chicken and waffles. Keep in mind that DW’s only serves brunch on Saturday and Sunday, so you’ll want to get there a bit earlier if you hope to beat the crowds. The signature menu, excellent craftsmanship, and expert chef are sure to make this one of your new favorite spots in Vegas. If rustic dining is your cup of tea, Hearthstone is the place to be. This eccentric American restaurant offers something different for casual dining. First and foremost, the restaurant’s signature feature, the two wood-burning ovens, create a flavor experience you can only get from Hearthstone’s kitchen. The brunch menu features everything from salads to breakfast pizzas to sandwiches and traditional breakfast staples like eggs and bacon. The restaurant even offers shellfish for brunch, if that’s your preference, or perhaps you’d like a drink to go with it? The “liquid brunch” selection, as it’s referred to, features 4 different drinks options to choose from. This rustic Summerlin restaurant has excellent ratings with patrons and critics alike. Chef Brian Massie is the mastermind behind the excellent menu, providing expert craftsmanship to the dishes and a unique ambiance hardly matched by competitors. While we’re only discussing brunch options, it’s important to note that the restaurant features an extensive dinner and lunch menu as well, so you can come back any time fo the day and experience the wonderful taste of this four-star restaurant. Best of all, The Hearthstone Kitchen only sources the best ingredients, acquired fresh for that authentic and memorable taste. Fresh ingredients make all the difference in this restaurant’s menu; just ask the fans! Located in downtown Summerlin on Festival Plaza Drive, this coffeehouse is setting itself apart from the competition with its excellent Latin Brunch menu. You won’t find many coffeehouses in the area with such excellent options for brunch and coffee. With endless coffee options, a kid’s menu and plant-based menu, this up and coming Summerlin destination has something for everyone. A dedicated and talented staff help make the menu and the experience one you’ll enjoy and recommend to friends and family. Makers and Finders fuse fine Latin cuisine with artisan coffee including their unique Lavender Infused Latte, made from their own lavender syrup. Or you can try the Mexican Spice Latte, that features spiced mocha syrup and cinnamon. Whatever your coffee taste, the restaurant has seven different brewing options, so there’s no limit to the combinations you can create for your morning coffee. Top it off with some of their excellent Latin cuisine options, and you’ll understand why Makers and Finders is so highly recommended. Makers and Finders is open from 7 am to 4 pm Monday through Saturday, and also features dinner and lunch menus, as well as an extensive cocktail, beer, and wine list for any time of the day. You can even enjoy their outdoor patio area, which looks out on Main Street and offers a wonderful view of the Summerlin area. With two locations, excellent staff, a unique menu and a truly one of a kind coffee house experience, this restaurant will quickly become one of your favorite brunch spots. How can you go wrong with artisan coffee and Latin cuisine? There are hundreds of restaurants in the Vegas area who have excellent brunch menus, and these three were just a few of the best. If you’re looking for an extensive list on Las Vegas brunch spots, go here. When it comes to restaurants, too much of the same thing can get old fairly quick. That’s why we’ve picked three spots with a different ambiance and experience to them than your traditional restaurants. These three are sure to provide a unique experience and lasting impression that you’ll be talking about for years to come. Whether you’re a Las Vegas native, or a traveler just passing through, these restaurants are must-visit locations.